Before and after repaint pictures. 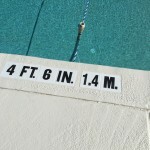 Posted on June 25, 2015 in: Pool deck repaint|Comments Off on Before and after repaint pictures. 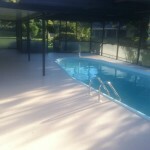 There is still time this year to get your pool deck resurfaced Orlando! 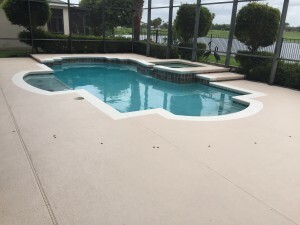 Posted on October 17, 2014 in: blog, Decorative Concrete, Pool Deck spray textures|Comments Off on There is still time this year to get your pool deck resurfaced Orlando! We are fortunate here in Central Florida, that our swimming pool season lasts well into the “fall” months. If you spent your summer looking at your old and worn out old pool deck, there is still time this year to get on our schedule! 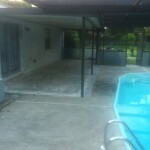 Take a look at the before and after photos below if you need more convincing to get your pool deck resurfaced. For this specific project, the owner had areas of mismatched concrete and old failing texture. 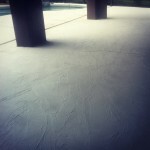 We recommended our spray texture overlay to help match the different concrete surfaces, as well as provide a great non-skid, mold, and mildew resistant surface. You can see from the photos below that this cost-effective decorative overlay surface helped make her old concrete pool deck look almost new! 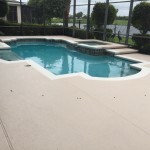 If you are ready to do the same on your pool deck, patio, or any other outdoor concrete surface, give the Decorative Concrete Experts a call today at 407-342-8552. 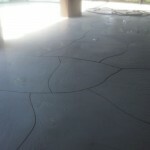 Or fill out our web inquiry form http://decorativeconcreteexperts.net/contact-us/! We service Clermont, Orlando, Winter Springs, and everywhere in between! 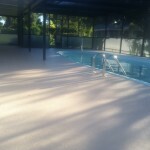 Newly textured pool deck in southeast Orlando in our “Kahlua” color. Pool deck ready for remodel! 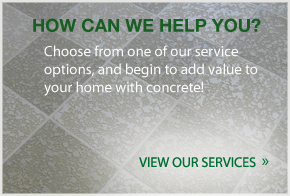 The benefits of stamped concrete for new construction. 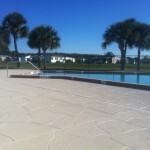 Posted on September 11, 2014 in: blog, Decorative Concrete|Comments Off on The benefits of stamped concrete for new construction. 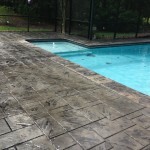 If you are looking to add a new patio, walk-way, or in the process of putting in a new swimming pool deck, we highly recommend checking out the options for stamped concrete. Stamped concrete can only be done with new construction and is not available as an overlay (existing pool decks, patios, or walkways). One of the many benefits of stamped concrete is that it can be formed and colored to achieve almost any look you could imagine. This allows our customers to be a part of the design for their own patio, pool deck, or walk-way, making for a truly one of a kind creation. Another benefit of stamped concrete is it cost-effective option over alternative materials such as pavers or natural stone. 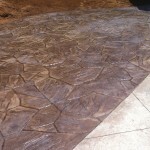 Stamped concrete is easy to maintain and the final product is long-lasting. If you are interested in the different options of stamped concrete, please call us, the Decorative Concrete Experts at 407-342-8552! We service the greater Orlando area and would happy to help you create your one of a kind new new patio, pool deck, walk-way, or driveway. 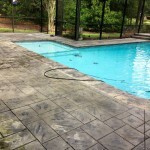 Stamped concrete pool deck addition in College Park (Orlando) in Flagstone pattern. 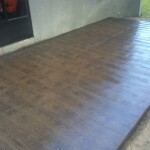 New concrete patio in Clermont with our Wood Plank stamp. 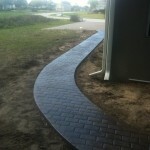 New stamped walk-way in Leesburg with the Running Bond Brick pattern. Unsightly cracks got you down? 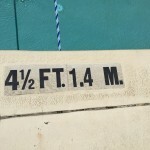 Posted on July 17, 2014 in: blog, Decorative Concrete, Pool Deck spray textures|Comments Off on Unsightly cracks got you down? Then maybe it is time to resurface or remodel! 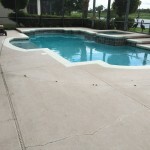 Cracks in your concrete pool decks and patios are inevitable unfortunately here in Central Florida. 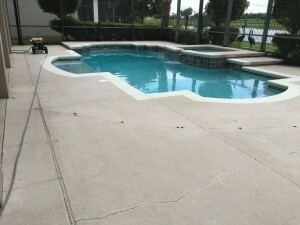 Here at Decorative Concrete Experts, we know how much this can bother you as the homeowner, when all you see instead of a beautiful pool deck, are the cracks in the concrete. These cracks, will always be there and will remain visible, regardless of what methods of repair are applied. However, we have a method we use that helps to conceal those cracks much better than just painting over them. We call it our “random stone pattern”. With this method, we use the lines of the cracks in your deck to create a pattern and use the cracks as the grout lines. The cracks will still be there but they will be far less noticeable than before. 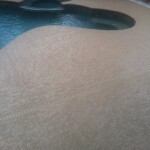 In order to do this method, we must remove the old surface of your pool deck, patio, driveway or lanai. Then, we resurface the area with our spray texture overlay and last cut in the areas to create the random stone pattern. 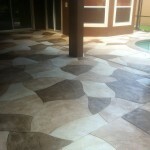 Check out these photos below of our spray texture overlay with random stone pattern! If you are interested in remodeling or resurfacing your pool deck, patio, or lanai or want more information on our Spray Texture Services call one of our experts in Orlando at 407-342-8552. 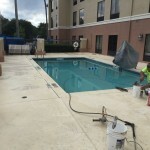 Get your pool decks and patios ready for summertime Orlando! 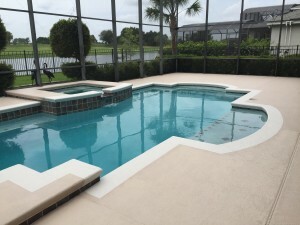 Posted on April 30, 2014 in: blog, Decorative Concrete|Comments Off on Get your pool decks and patios ready for summertime Orlando! 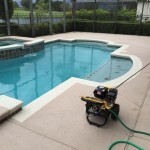 Summertime is rapidly approaching here in Orlando and what better way to fully enjoy your pool deck, patio, or lanai than to freshen it up with a pressure wash and re-seal. 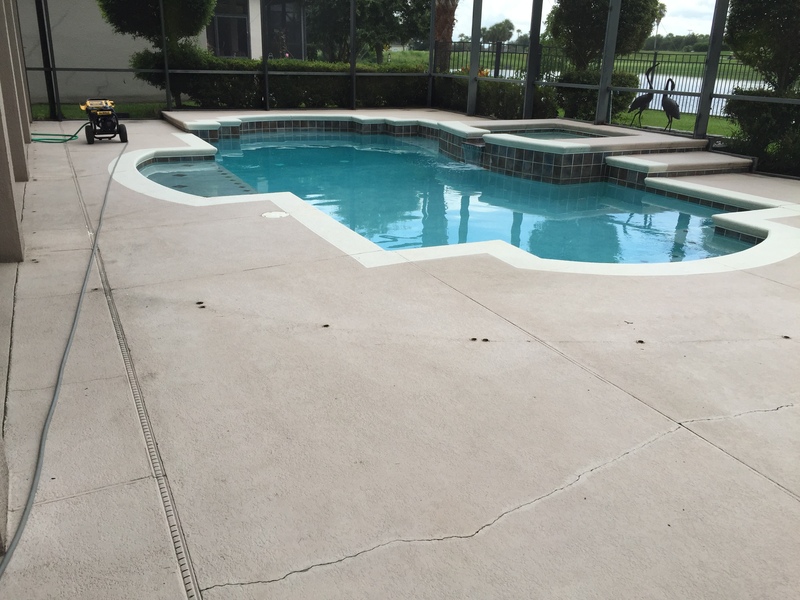 Revitalize your concrete patio or pool deck with a fresh new coat of sealer. 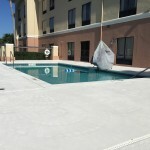 Our guys specialize in sealing many types of existing surfaces, from pavers to decorative concrete concrete. 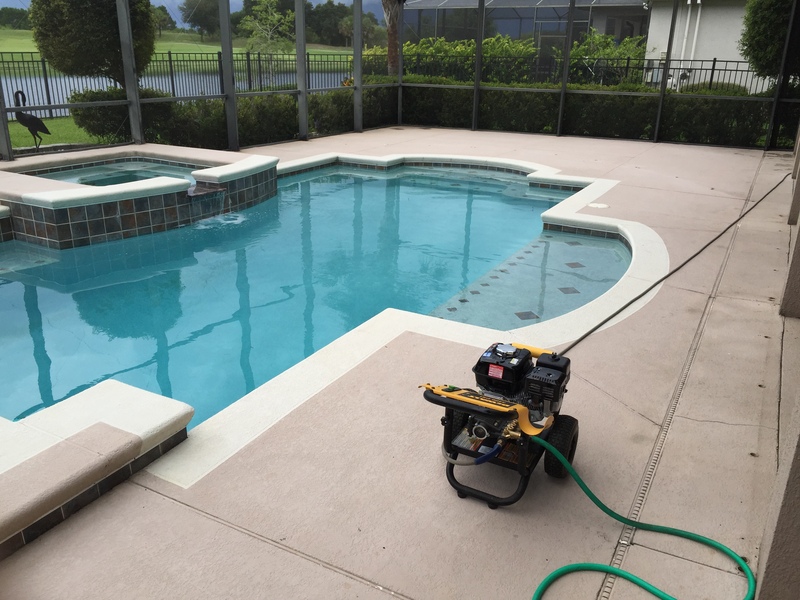 We will clean up the surface with a high powered pressure wash and then put down a fresh coat of paint or sealer on your pool deck or patio. This will ensure your deck will continue to look great for years to come! 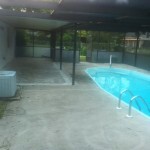 Check out the before and after re-sealed concrete pool deck photos below. Give us a call 407-342-8552 and speak to one of our experts!